Setting a matched betting target is arguably one of the most important and worthwhile things you can do when you first start your matched betting journey. It gives you a goal to aim at and ensures you stay committed in the long run. In this article, we’ll look at why matched betting targets are so effective, what’s a realistic target to aim for and how you can best achieve your new goal and maximise your earnings online. Why set a target for matched betting? Goals and targets are very important for life in general. It’s often said that when you don’t set goals, you can spend your whole life running up and down and not achieve anything. That logic also applies directly to your matched betting. Below are some of the key reasons for setting a matched betting target in 2018. As we’ve already mentioned, setting targets is a very effective and worthwhile thing to do for matched betting – it gives you a certain vision to work towards. Without a specific target in mind, how can you determine how hard you need to work and where you need to get to? People who set matched betting targets generally meet their goals, creating a greater sense of accomplishment and motivation to continue in the future. As with anything, there’s always going to be setbacks along the way, but with a little motivation you’ll soon be over those hurdles. Keep your eyes on the end goal and you’ll love overcoming obstacles. Members who regularly set targets invariably outperform those who don’t in terms of monthly and overall earnings. 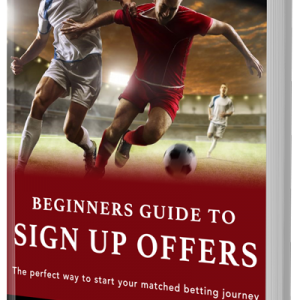 They’re continually pushing themselves to beat their past goals and maximise their results from matched betting. As you can see, setting a matched betting target is one of the most important aspects of maximising your overall profit with this method. It gives you a long-term vision and short-term motivation. So you’ve decided to set a matched betting target but what’s a realistic goal you should aim for? Obviously this varies from person to person. Depending on your current matched betting ability and the amount of time you spend matched betting your goal will undoubtedly be different. Some people are happy for matched betting to bring them a secondary income, where as others want to make a full time income using this method. Whilst it’s important for everyone to set targets, it’s vital if you’re using matched betting for your primary income. For those of you just getting started with the sign up offers, a target of £500 in your first month would be a realistic goal to set. This is something we recommend most of our new members aim for when they get started, no matter how much time they can dedicate to no risk matched betting. For those more experienced matched bettors who are looking to set a target for the first time, I’d suggest a goal of anywhere up to £1000 a month would be achievable. If you want to make a full time income from matched betting, I’d suggest you start off with a target of £1000 and work up from there. This way you won’t get disheartened if you don’t reach your target. Whatever matched betting level you’re at, it’s important to make your target a challenge. You need to push yourself to get there. If and when you achieve your target, you should increase it by about 10% for the next month to ensure you maximise the full potential of your matched betting. Always make your target slightly harder to achieve each time. There will always be more offers for you to complete, the challenge is completing as many of them as possible. Once you’ve set your target, it’s important to keep track of your matched betting progress along the way. I suggest you record how many offers you complete along with your monthly and overall profit. There are a number of different ways you can track your matched betting which we’ll have a look at below. For those of you who want to start matched betting part time, it may be worthwhile for you to track your matched betting using a simple spreadsheet. You may want to include more information but the more simple it is, the easier it will be to read. I suggest you create an auto-sum to calculate your overall profit, you can then see how close you are to achieving your target. Whilst this isn’t the most sophisticated method, it still works well and is obviously very inexpensive. Most people have access to some kind of free spreadsheet software. Tracking Plus is our dedicated solution to tracking your matched bets here at The Sure Bettor. It’s an incredibly sophisticated system that completes the whole process for you. All you need to do is complete an offer and input your profit for each one. The software does the rest for you. The software keeps track of which offers you’ve completed and displays them in an easy to understand table along with your monthly and overall profit since you’ve been a member with us at The Sure Bettor. Below is a screenshot of the Tracking Plus feature you’ll have access to if you’re a member with us at The Sure Bettor. We also created a function that allows you to set a monthly targets. Your progress is shown on a graph at the top of your dashboard. This allows you to visually see how you’re doing against your target. 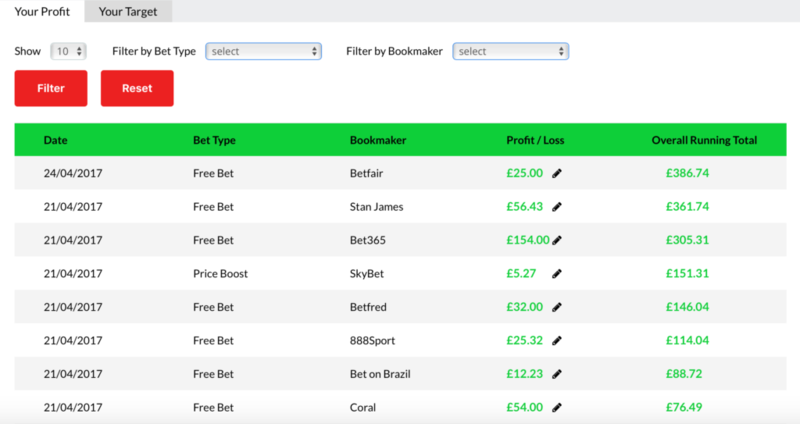 Visit this article for more information on how Tracking Plus works and how it benefits your long term matched betting profitability. If you’d like to see more benefits of premium membership at The Sure Bettor, you can visit this article. That’s it for this article, thanks for stopping by and remember to always set a matched betting target – it will help you in the long run.